Paying the penalty, mind games and other issues for the Premier men to ponder. WE CAN DEBATE the rights and wrongs of the “Nash Rule” all winter but Tipp have a problem that they need to solve right now. There’s a good chance that they would already be All-Ireland champions if either Seamus Callanan or Bubbles O’Dwyer had converted the penalties they had in the drawn game or, in hindsight, if they had even taken a point instead. If they get a chance again, what will they do? Will Callanan or Bubbles be confident enough to step up and face Eoin Murphy again? Or might Eamon O’Shea spring a surprise and bring in Eoin Kelly from the bench? The drawn final was very much a forwards’ game — there were a remarkable 54 scores, 44 from play. Between them Tipp’s quartet of Callanan, Bubbles, Noel McGrath and Lar Corbett finished with a brilliant 0-16 from play, the kind of tally that would win most finals. Callanan and Bubbles shrugged off any concerns about inconsistency and proved that they were ready for the big day while McGrath and Corbett were pivotal figures during different phases and showed a marked improvement on their earlier Championship form. Can they produce that kind of performance again? The rivalry between these two neighbours is legendary but in the big games in recent years, Kilkenny have always had the upper hand. Tipp’s record is dreadful, and the 2010 chapter of their classic trilogy is the solitary exception. How can they go about overcoming that challenge? Psychologically, how they reflect on the drawn final will be important. They struck 1-28 and still couldn’t shake Kilkenny off. Can they stay positive? Flipping that, it’s rare enough that a team concedes three goals against Kilkenny and still lives to tell the tale. Goals were the lifeblood of the Cats’ challenge the last day. Had Tipp kicked on when Bonner Maher’s opening goal put them five points up, the afternoon could have panned out very differently. Instead Richie Power struck at the other end within a couple of minutes and Kilkenny were back within two at the break. TJ Reid and Power hit a goal apiece in the second half and it left Tipp with a mountain to climb. They did superbly well to finish with three unanswered points and draw the game but if they had snuffed out Kilkenny’s goal threat, they would never have found themselves in that position. Kilkenny have a subs bench brimming with experience so it’s only natural that part of the focus will also fall on the options at Eamon O’Shea’s disposal. O’Shea has named an unchanged side and so the four men who came off the bench in the drawn game — Michael Cahill, Eoin Kelly, Jason Forde and John O’Brien — will all have to bide their time again. Cahill played a vital role when he replaced Gearoid Ryan for the final 20 minutes, and both he and Forde finished with a point. We know the experience a fit Kelly can bring. The sight of Shefflin warming up on the line will certainly get the Kilkenny fans going. Tipp need their own subs to have as much of an impact on the pitch. Email “5 talking points for Tipperary ahead of today's All-Ireland hurling final replay”. 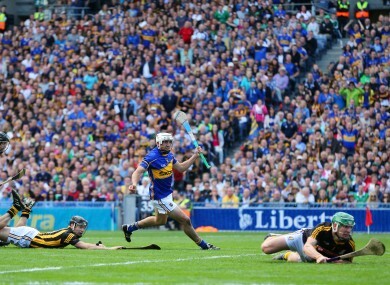 Feedback on “5 talking points for Tipperary ahead of today's All-Ireland hurling final replay”.